by Jenna J (transcribed by Michael Readman) There are very few fighters that fought in the ring and had an impact like former 5 division world champion Sugar Ray Leonard. He was the face of the sport and was involved in some of the biggest events the sport has seen, having fought and beat all-time greats Roberto Duran, Thomas Hearns and Marvin Hagler. 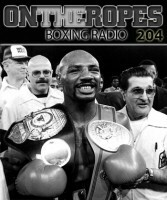 In this “On The Ropes” interview with Sugar Ray Leonard, he talks about how he got into the sport and discusses in detail some of the greatest moments from his boxing career. Leonard also speaks about some of the relationships he made in boxing and his thoughts on the sport today. 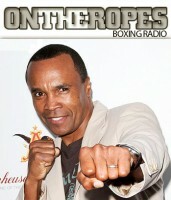 Here is what Sugar Ray Leonard had to say. Jenna J: Ray since your boxing career ended, you found another career, that being a motivational speaker. Why did you choose to get into that after you left the ring? Ray Leonard: Well, I’ve always really wanted to inspire people and motivate people. I got with some wonderful agents, Washington Speakers Bureau and I’ve been doing this for over twelve years. I always felt that everyone outside of the ring was a fighter because you know we get knocked down in relationships, business and what have you, we need a great corner or your staff. We need great motivation, determination, focus. All the things that we need, all the principles that we apply to become a world champion in every day life. I’ve thoroughly enjoyed telling my story of how I became successful. Jenna J: Ray as a boxer, you carried the nickname ‘Sugar.’ How did you come to use that during your boxing career? Ray Leonard: Well, ‘Sugar’ Ray Robinson, that’s the man, that’s the real Sugar without question. I’ve watched Sugar Ray Robinson tapes, I tried to emulate his performances and his presentation, his fighting style, he was just an amazing not just fighter but entertainer. I studied him for years but a guy called me Sugar one day, Sergeant Johnson, who was the assistant boxing coach in the Olympics in 1976. So being called ‘Sugar’ Ray has just been a humbling experience, it’s been wonderful. Jenna J: Speaking of the Olympics Ray, how important was the amateur experience you had in making you the fighter you became? Ray Leonard: Well, you know that experience as an amateur was really my foundation for my professional career, and to any boxer’s career because you gain that necessary experience, you gain the ability to be versatile because you face various oppositions, southpaws, tall, short fighters, strong fighters, slow fighters. Once you attempt to make that transition from amateur to professional, nine times out of ten you should make that move quite easy. Jenna J: After winning the gold medal there was some doubt on whether you would turn professional. Why was that a hard decision to make? Ray Leonard: When I won the gold medal in 1976 in Montreal that was the ultimate goal, that was my dream and I did that. It was kind of a bittersweet thing when I stood on that podium with that gold medal and the American anthem was being played because I knew that it was over, I knew that I was gonna go to college and leave boxing behind. My dad was very sick and the hospital bills were just astronomical so the only reason I turned professional was not on desire but out of financial necessity. I paid the hospital bills, my dad regained health and I said you know what, this is not a bad job and I continued to do it until I became a champion. Jenna J: You had a lot of pressure coming out of the Olympics after winning the gold, how do you think that effected you in your early professional career? Ray Leonard: I think it effected me good and bad, but mostly good. The bad part comes every now and then when you the individual start to believe the hype. It gets to a point where there is too much too soon. First of all boxing is a poor mans sport and then to be thrust into super stardom and to the fame and fortune, that gets to be too much if you don’t keep things grounded and in perspective. I’m no different to anyone else and for a second I got off track but I had good people around me and with me, I got back on track. The name of the game is perspective, it really is. Jenna J: Well you did go on to become a champion like you wanted to, and reigned as one until your first loss at the hands of Roberto Duran. Ray, what was the change you made between the first and the second Duran fight? Ray Leonard: It was really a simple change, all I had to do was box Duran. What I couldn’t do the first time was, or what I wouldn’t do the first time because Roberto Duran taught me the importance of psychological warfare, he really beat me mentally, which made me fight him at his own game, toe to toe, which was not smart but I was still learning at that point. Jenna J: After the Duran fight, came the super fight. Sugar Ray Leonard vs. Tommy Hearns. This match brought on one of the most talked about moments for boxing fans, as your trainer Angelo Dundee said before the 13th round, “You’re blowing it, son. You’re blowing it.” How do you think that moment changed things for you? Ray Leonard: That fight was a defining moment in my career, and I do recall it like it was yesterday when Angelo yelled “You’re blowing it.” The beauty of Angelo, or what I loved about Angelo Dundee is the fact that he says the right thing at the right time, in the right way. He gives you the perfect sound bite, when he says you’re blowing it, he says that with a conviction but not a desperation. I knew I had a few more rounds, I knew I had to pick up the tempo, pick up the pace and I just went out there although I was extremely exhausted, I was spent, but I knew the last few rounds were a deciding factor in the fight. 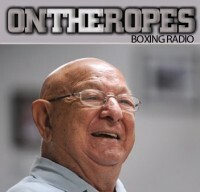 Jenna J: How important was it to have a trainer like Angelo Dundee in your corner? Ray Leonard: Angelo was also a friend, he was a guy I knew through the years of watching my idol Muhammad compete. So naturally having him in my corner was just a plus, it was so positive. He was well respected around the world with the boxing industry and all the boxing aficionados. Angelo’s knowledge, his ability to stay calm in the heat of battle, those were the precious moments and the valuable moments that are priceless for me. Jenna J: You defended your belt just once after that and then discovered the eye injury that caused you to retire and then you came back for one fight. It was 5 ½ years after the Hearns fight that you decided to take a fight with Marvin Hagler at middleweight. Why did you want that match after so much time outside of the ring? Ray Leonard: Well, I saw Hagler’s last fight prior to my fight against John Mugabi and I saw a part of him which was not fluid, he was very lethargic in that fight. He was being out boxed by a slugger in John Mugabi and I said well, if I box a little better than John Mugabi, I can beat Hagler. Hagler was an amazing fighter and champion, he was ambidextrous and he could hit with both hands, but I felt the speed would be a real challenge for him, it could nullify his strong points, and that’s the reason I decided to take that fight. Also I had my own fights in the gym with real fighters that I flew in. I had judges come in, I had an official referee come in and I went through twelve or fifteen rounds to get myself that feeling again in the ring. Jenna J: So those exhibition fights were what prepared you for fighting someone like Hagler after all that time out of the ring? Ray Leonard: Without question, without question, because I got that feel back, I got the presence back because what happens with fighters leaving the ring for that significant amount of time, is that you lose your presence in the ring, you’re not used to being hit again, you just lose that edge. The only way to get that back is to experience that feeling of being hit and to get that pushing around and that whole sensation of being in the ring with real fighters. I did that with no head gear, they had fight gloves on, they had ten ounce gloves on and I had fourteen ounce gloves on. I went about twelve or fifteen rounds. Jenna J: Now going into that, was the plan to box him, or was that something you decided once you got into the ring with him? Ray Leonard: Well, prior to the Hagler fight I was set on fighting Hagler toe to toe because I knew he had a lot of scar tissue and I knew I had fast hands, I was gonna use my hand speed. But then again also during training camp I was really being a dominant guy in the ring as opposed to being a boxer, but what had happened five days before the fight, the Hagler fight, I get basically practically knocked out by Quincy Taylor who later became world champion himself and I said this is not a good idea, it’s not a good strategy. Five days before the fight I changed my mind and decided to box Hagler which was you know, effective. Jenna J: You ended up beating Hagler by decision over 12 rounds and it ended up being a decision that fight fans still debate today, but what I’m wondering is about the distance of the fight. You asked for the fight to be 12 rounds, do you think you need that extra edge to help you pull out the victory? Ray Leonard: Well, for my head I needed twelve rounds. For me personally it was always what I thought, what I figured would give me an edge and you know, twelve rounds sounds better than fifteen rounds, although if we had gone fifteen rounds I would have trained for 15 rounds. Fighters can go the distance because of the adrenaline and the desire and the determination. If we had to go fifteen, I would have paced myself for fifteen rounds. Jenna J: Fans wanted to see a rematch, but it never happened, and when I interviewed Marvin Hagler, he actually said that he waited around for a year for you to give him one, and you didn’t, so he retired. Do you have any regrets about not having a rematch with him? Ray Leonard: No, there’s no regret because that was never the case. Why wouldn’t I have given him the rematch? That would of been the prefect fight again. That first fight was relatively close but, if there was genuinely so much interest for the second fight I would have done that in a heartbeat. Hagler, I think he forgets that he went away, he moved to Milan, Italy. So he was the one who threw his hands up and said no more, I’m not gonna do this any longer and he retired. I need to call Hagler or you need to call Hagler back. 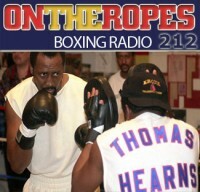 Jenna J: The bout with Hagler was not your last memorable fight, you had a rematch with the “Hitman” Thomas Hearns, and it played out quite different then the first, and most fans believe you should have lost it, what are your thoughts on it today? Ray Leonard: Oh I did. You know, I lost that fight, as far as I was concerned Tommy should have had his hands raised for that fight. He dropped me twice, he got the best of me and hey you know what, I’ve always admitted that. The first fight was in my favor but the second fight Tommy came on strong and did his thing. Jenna J: Ray, do you keep in contact with any of the boxers you met in the ring? Ray Leonard: I keep in contact with just Tommy. When I see Duran we talk, when I see Hagler we will acknowledge each other and have a conversation, but Tommy is the only one I keep in contact with, or have been keeping in contact with since our careers ended. 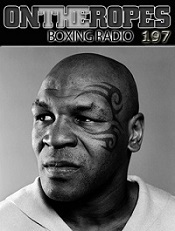 Jenna J: Looking at boxing today Ray, what do you think is the sports biggest problem? Ray Leonard: I think there are too many self governing bodies out there, there’s just too many that are confusing to the public and to the fans. I’m a fighter and it’s confusing to me. I think champions should fight champions and unify the division, it’s more than just money, it’s bragging rights. Back in the day when we fought we fought for pride too, we fought for the money no question about that but we fought for pride, you stood up for the championship that you owned. Jenna J: When you look back at what you did in boxing, what are some of your favorite moments? Ray Leonard: Well, a gold medal again was so powerful and so special for me because it wasn’t really about money, it wasn’t about fame, it was about representing myself and my country. That gold medal was really big. I turned professional out of financial necessity but once my dad got his health back together, beating and winning my world title against Benitez was huge but unifying it against Tommy Hearns in ‘81 was even more astronomical, it was just as big and even better, and coming back and regaining my title from Duran. I’ve been a very blessed man and grew up in an era where there was such an amazing and abundance of talent, so many champions so many great champions and I had a chance to be in that era and compete against those guys. My career without question was amazing. Jenna J: Any message you want to pass along to your fans? Ray Leonard: I always loved my fans, I love all the ones that supported me, got behind me, stayed with me then and even now. God bless. 24 Responses to "Sugar Ray Leonard: “I think champions should fight champions and unify the division, it’s more than just money, it’s bragging rights”"
Sugar Ray was one of the greatest boxers of his time. He never ducks an opponent. Not like Gayweather, He hand picks opponents that are very easy for him. I really admire Sugar Ray for his courage, strength and style. He truly is a great champion! Mayweather will not fight if he were here today.. Yes, Sugar Ray Leonard was a superb fighter in his time. He had to fight those in his class and ranks just to know who is the best and emerge as champion. He was not a choosy fighter, and did not mind whether one was possessing good number of wins without any loss. What matters in boxing is if you are sensational boxer you are ready to face anybody in his prime and to make a real enviable record history. That’s a mesage for Floyd mayweahter – Champions should fight champions. Llo, you are implying that Pac is a champion. Last I checked, Pac has lost 2 straight (3 if you count the jmm 3 fight) and is fighting Rios (who lost his last fight) in a non-title fight. If Floyd fought Pac, it’d be because it’s the biggest money fight out there. That’s what he’s been doing, but you and others complain when he does it. Wait for Pac-Rios fight if Pac won, Floyd should challenge Pac So that people will have no doubt if he really easy for him to beat Pac. Remember, Floyd had been evading Pac for 3 years when he was a wbo champion and no.1 Pound for Pound as same as Floyd before his 2 lost. The fight between Pac & Money been a public conversation since three years back. When they both a champion & in their prime…And Mayweather family always bragging that Pac is one dimensional fighter & no way could defeat May,….. So if that is the case, why this fight still not made. beside we are talking of 100million dollar fight… Isn’t May really ducking the Pacman??? You ducked Pryor! Although I am your fan. 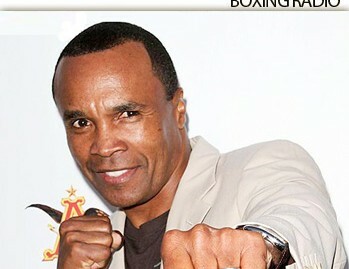 Prime Sugar Ray Leonard vs. Prime Floyd Mayweather Jr….. who’d win? and sugar is willing to fight toe to toe not like gayweather,the running one..
Pactard doesnt even have a belt and is fighting rios who lost his last fight. It sounds more like he’s ducking why’s he fighting the one lost the fight, instead of the winner . Marcus..do your research why Pac is fighting Rios and not Alvarado…. 1st statement: …and yes Pacquiao your next. Very interesting. I’m 56, and despite having studied the Leonard-Hagler fight like JFK conspiracy theorists study the Zapruder film since the night I saw it on Closed Circuit (I always come up with a Draw), I’d never heard the story about SRL changing his fightplan due to getting shaken up by Quincy Taylor. Nice interview, Jenna. Ali was the greatest & Ray Robinson was the second best and Rocky G. 3rd.Sugar Ray Leonard was in a class all of his own. May God continue to bless him and his entire family always. to late for floyd now, he squandered his career for the zero,all that great natural ability and talent he just ducked out on the great moments he could have created for himself and the Boxing fans,history ffs ,just to not risk that 0.i know i speak for millions who arent blinded by sycophant idolatry of floyd mayweather .only the real boxing fans who understand the importance of challenging the best at their best so at the end you can say ‘i fought everyone they put in front of me ,never ducked anyone ,ever ” he cant say that and believe it because he knows what he did and he also knows that there are enough fools out there to keep his name afloat. no f**king way it dosent bother you,that $$ will only cover it for so long then your alone and have to think about the reality of it .